Above, looking southeastward toward the Mule Mountains from a position on the first terrace above the San Pedro River floodplain, west of the river valley. The Babocomari River lies in the foreground, the gallery forest of the San Pedro River runs across the middle of the photograph, taken July 2002. Below, this TOPO! map shows the western flanks of the Mule Mountains. The highest portions of these mountains lie along the Escabrosa ridge, with Mount Ballard near Bisbee at 7,300 feet. Prior to the devastation of the conifer forest by Bisbee miners after 1880, vegetation included Douglas Fir, but today the highest points lie along Pine-Oak Woodland. As you can gather from the map, the western and southwestern portions of these mountains are undergoing development. The area around Bisbee has been heavily developed since its founding as a mining center in 1880, when forests were stripped for housing and mining construction. 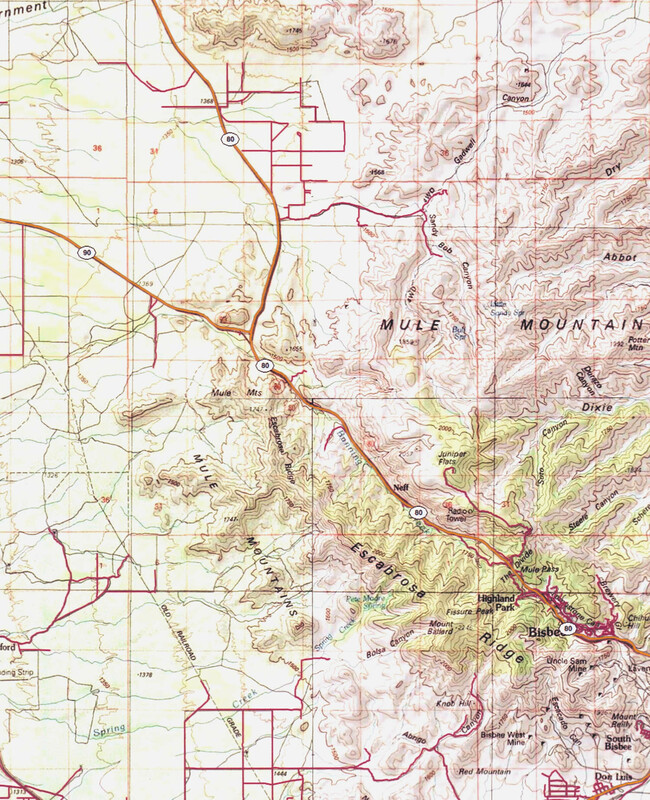 State Highway 92 runs across the terrain just below the map portion shown, paralleling the Mexican border. Below, Mule Mountains from State Highway 82 west of Fairbank, April 18, 2009. San Pedro River Gallery Forest at middle distance. Click on the image to enlarge it.